In Australia, you will not find a single city, which age would be several hundred years. The exception, perhaps, is Sydney – the oldest and most famous city of the country. It is as old as Australia, because they were formed at one day – January 26, 1788. Picturesquely located on the numerous steep slopes to the ocean, the city amazes by a diverse architecture and individuality of buildings. The structure of the city is largely determined by the uneven terrain. A huge number of streets- long and short, straight and winding are confusing not only tourists, but also the experienced taxi drivers. In this case, a special book-directory with a map of all the streets of Sydney can help tourists. In Sydney, it is sunny and warm, winters are mild and summers are not hot. It is necessary to remember: when we have summer, it is winter in Australia. Many tourists prefer the Australian spring-summer season, which corresponds to the European autumn and winter. Especially it concerns tourists with children, who choose visiting Sydney in the wintertime to get a warm and to have a good time. We recommend you to visit the Sydney Zoo and Luna Park with your children, using car rental in Sydney Airport. The park was opened in 1935 and until now, it has preserved the old-fashioned atmosphere and cheerful color, which attract not only local residents, but also many tourists from all over the world. Some key attractions are from the middle of the last century and they still delight visitors of all ages, while others were made with the help of the latest technologies and give guests unforgettable extreme sensations. Some buildings on the territory of the amusement park are of a historical value and they are listed in the National Estate of Australia. 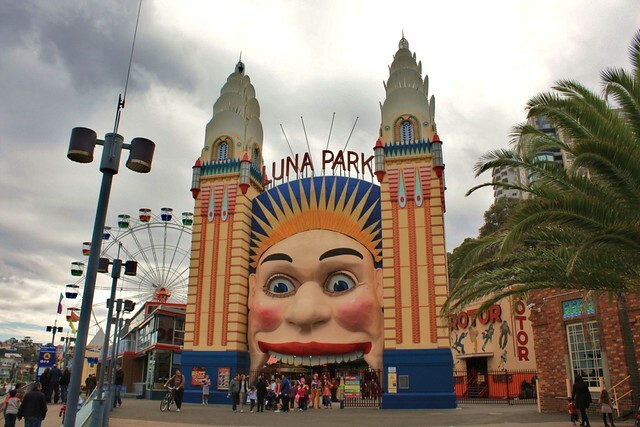 A special distinctive feature of Luna Park Sydney is its main entrance, made in the shape of a huge smiling face with two glowing towers on its sides. This sign of the park is seen for several hundred meters, boosting the visitors’ spirits already on the way to entertainment complex. This Luna Park is a great place for a family holiday. There is a huge number of children’s and adult carousels, cool “roller coaster”, water attractions, numerous cafes and souvenir shops. As in any entertainment park, visitors can view the panoramic beauty of the city, making an exciting trip on the Ferris wheel with height of 40 meters. One of the most popular entertainments here is a fun attraction called “Tango”. It is a fun ride on a locomotive, which constantly changes the speed of movement and periodically flips passengers on the undulating path. As a result, people are constantly bouncing and cuddling together, contagiously laughing. Visitors, with a good vestibular mechanism and a strong stomach, can experience themselves on the attraction “Ranger”, similar to a regular pendulum boat. However, inside it is equipped with grilles and cushions in the head area. Starting with a slight swing, later it turns its passengers vertically, at an angle of 90 degrees, and the lack of seat belts forces the passengers to take various unthinkable poses. In addition to rides, guests of the park can watch colorful costumed performances, visit a concert hall for 2,000 seats and dine in a chic restaurant overlooking the ocean. “Luna Park Sydney” is waiting for its visitors from 10.00 to 18.00 during school holidays, on other days the park is opened only 4 days a week with a changing schedule. The cost of the visit depends on the height of the visitor and the time of the day. The cost of the ticket, which will include all rides, is from 25 to 45 Australian dollars. Taronga Zoo is the most famous and oldest zoo in Sydney. Officially, it was opened in October 7, 1916, under the auspices of the Council for Zoological Parks of New South Wales in the Mosman suburbs of Sydney. The name of the zoo from the language of local aborigines means “beautiful view”. It is located on an area of ​​21 hectares, making it one of the largest zoos in the world. It is recommended to visit the site of the Taronga Zoo in advance to watch the schedule of the shows. If you have limited time, you can use Audio Tour, which can be downloaded beforehand for both the iPhone and Android, and it is completely free. It is better to come in the morning- the animals are more active, it is not crowded and you can fully implement your plan to observe the zoo and see the two main shows. The zoo is divided into eight zoogeographical sections. Below are described sections 1 – Reptile World, 2 – African Safari and 8 – Free-flight Bird Show. The road to this area is preceded by a structure called ‘Koala Walkabout’. Apparently, it is for the visitors not to miss a meeting with this Australian animal. On the exit from the building where the reptiles are kept, it is possible to watch a lecture for the children. They are told how not to be afraid of Australian reptiles if you meet them on a walk in the bush or in the courtyard of the house, and what to do or not to do when meeting them. This section is preceded by an enclosure with giraffes. The view that opens behind them is simply incomparable. Many tourists make photos with a giraffe on the background of Sydney. It is better to watch the time for photographing on the site. In the summer, when there are many visitors, photographing with a giraffe should be booked. Further, there is a large cage with chimpanzees. Along the cage, there are benches, where you can sit, relax and watch the animals. Then, there are several open-air cages with mountain goats, which are located on the winding and descending path, creating the impression of a mountainous area. Since the Bird Show is popular, now it can be watched twice – at 12:00 and at 15:00. In 2011, here, in the Zoo, a couple of Andean condors had a progeny. The hand-fed bird was called the Muppet. It grew quickly and the workers prepared it for a long time to participate in the “Free Flight” show. Muppet is the star of this show and it attracts the attention of the public to the fate of its wild congeners. Andean condors are the only representatives of condors that are members of the family of American vultures. Their homeland is the Andes and the west coast of South America. Andean condors are long-livers. In captivity, they can live for about a hundred years. In addition, these strong birds are the owners of the largest wingspan (3.2 meters) and the second largest weight among flying birds.